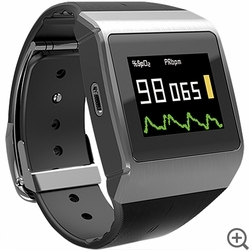 FL500 / CMS50K Wearable SpO2/ECG Monitor integrated functions of SpO2, ECG and pedometer in one product. CMS50K Wrist oximeter ECG monitor is a set of blood oxygen, pulse rate, ECG, pedometer in one of the smart Health Watch. Pulse oximetry is the blood concentration of photoelectric detection technology and volume pulse described technology together to achieve non-invasive continuous spot-check monitoring. ECG function of an expert in the prevention of cardiovascular disease, anytime ECG detection, easy to operate. Pedometer function Step 5 or more user identification number and count gait. The instrument does not belong treatment equipment, only for anytime, anywhere oxygen, ECG, pedometer measurement and storage. Operation is simple, less demanding for the operator. Compact appearance, easy to operate, easy to carry. Can be detected and recorded in real time anywhere oxygen values, pulse rate value, ECG and heart rate, the number of steps and calorie count. With real-time clock function, it can display date, minutes and seconds, when no oxygen, ECG measurements, can be used as an electronic clock. Applications: This instrument applies to family, health places, not a substitute for conventional oxygen electrocardiograph for clinical medical examination. Suitable for: long-term work pressure, workload high populations; heart disease; the elderly and health groups. This application is used for a variety of medical testing equipments of our company. It can be used to receive data by Bluetooth and upload the data to servers,and view health records,trend charts,health suggestion and so on. This application can be associated with Apple HealthKit,the measurement results will be synchronized to Apple HealthKit(iPads do not support). Open Apple's HealthKit --> Sources --> PHMS，to set items which you allow "PHMS" to write data.